I traveled very briefly through western peninsular Malaysia and Singapore on my way from Thailand to Indonesia. I was in the city of Georgetown aka Penang, on the bridge-connected island of Penang for New Year’s Eve, which was very low key. I had a beer with a couple of western backpackers from my hotel where we had been warned that we should keep a low profile. The Chinese New Year is a much bigger event and celebrating on the 31st of December was seen as some kind of provocation, which is unusual since Malaysia is a generally calm, tourist-friendly country. 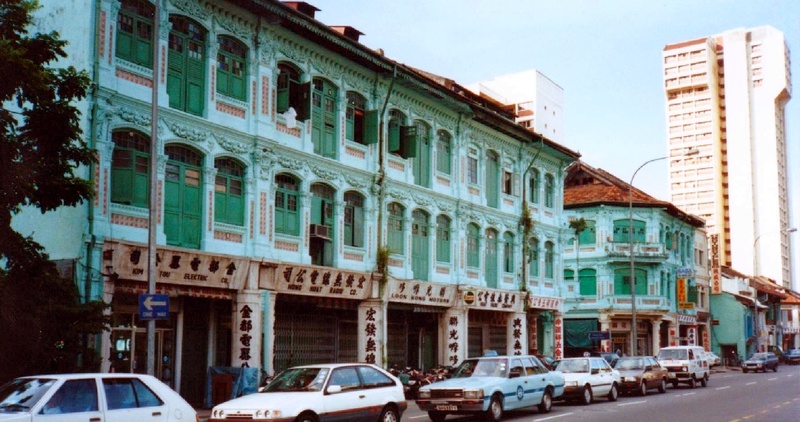 The picture hints at the mixed history and culture of the city, which also has English colonial influences in addition to Malaysian, Chinese and Indian. 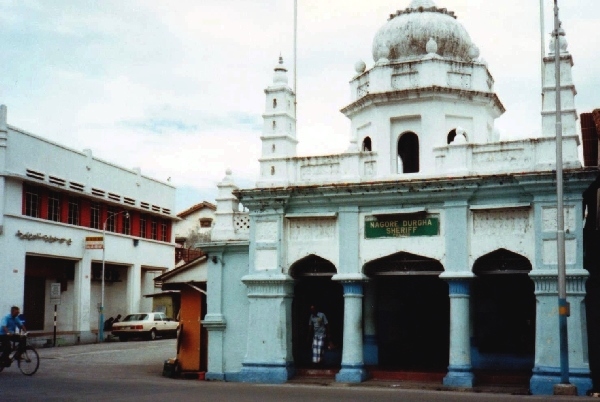 The major religion in Malaysia is Islam so one sees plenty of mosques in Georgetown as elsewhere. 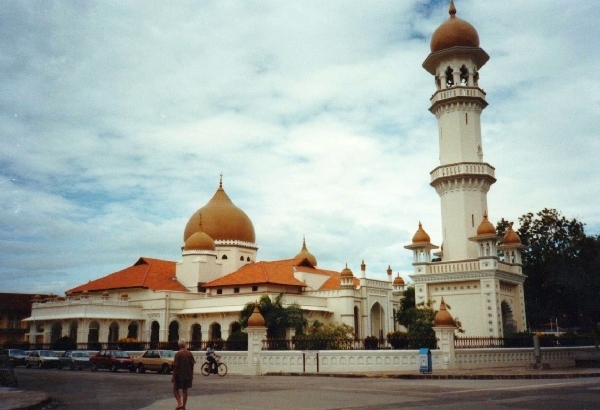 This was long before Al Quida and although there were occasional conflicts between the Buddhists and Muslims in southern Thailand and northern Malaysia, this didn’t seem a major concern for westerners. Of course there are also plenty of examples of English Colonial influence and architecture to be seen as well. Not only were there buildings and such monuments but churches in addition. The British East India Company did major trade in the region from here. The Japanese occupied the region during WWII and let The Germany navy use the Georgetown Port, but it reverted back to the British after WWII. 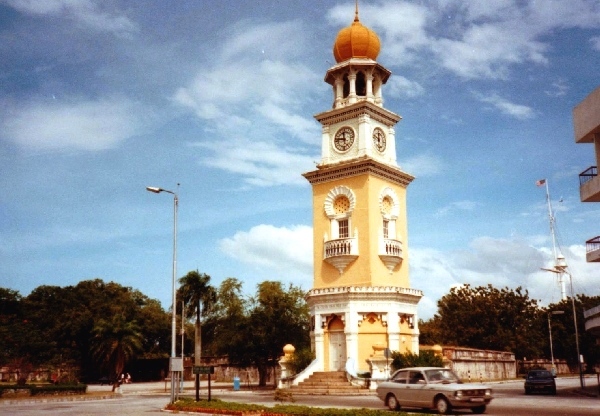 Georgetown was not incorporated into the Federation of Malaysia until its creation in 1948. Georgetown got the status of UNESCO World Heritage site for its “unique architecture”. For what I don’t know? 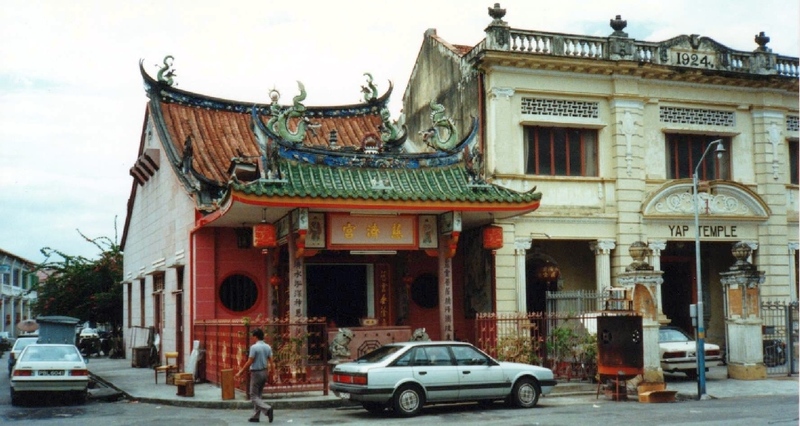 The older buildings and even temples are honestly less impressive and a very similar style to what one sees in Singapore. 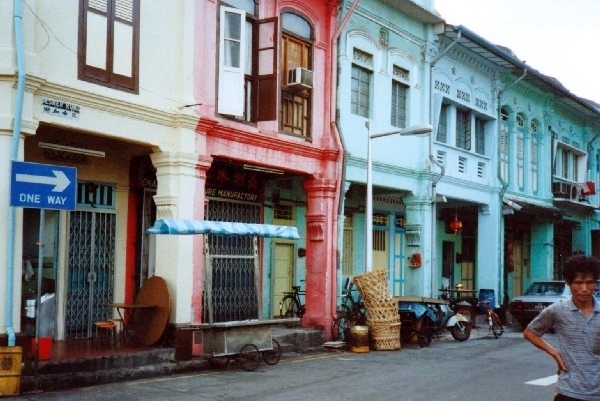 Here was an old man street performing in central Georgetown spinning a plate on a stick. He also handled live snakes, spiders and scorpions. 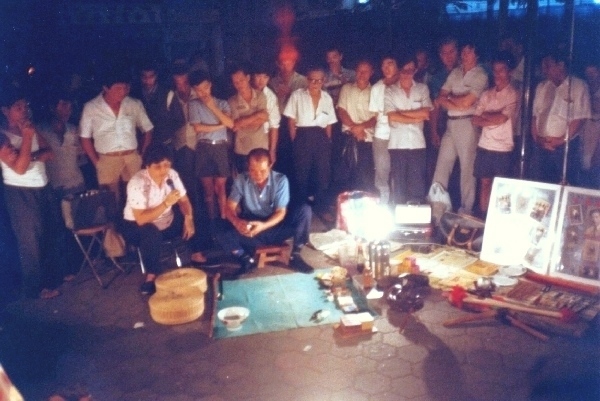 His show seemed to be intended to sell various medicines and charms. Rather than to entertain the people, the goal was to impress the audience what great tricks he could accomplish having consumed enough snake oil, as if buying his potions would enable anyone to do this. 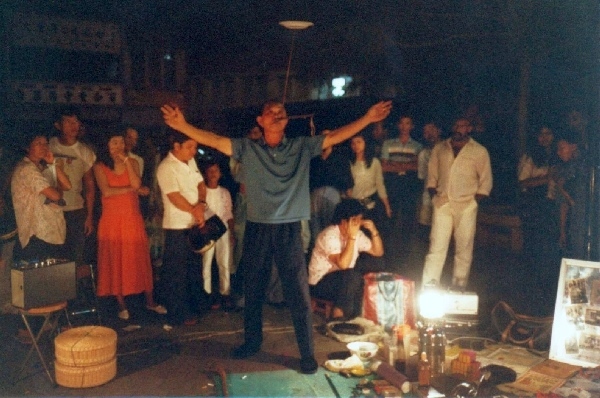 Actually, one afternoon of training would have been sufficient for many people to reach the level of his juggling technique. Disneyland was it not but there was a small amusement park with rides for kids that was fancier than anything else of its kind I had seen in Southeast Asia until then. 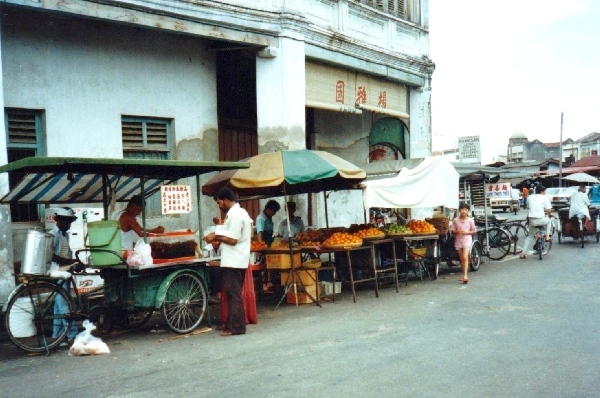 Okay, here is also proof that some outdoor food carts and markets were still in existence but I think their days were numbered. 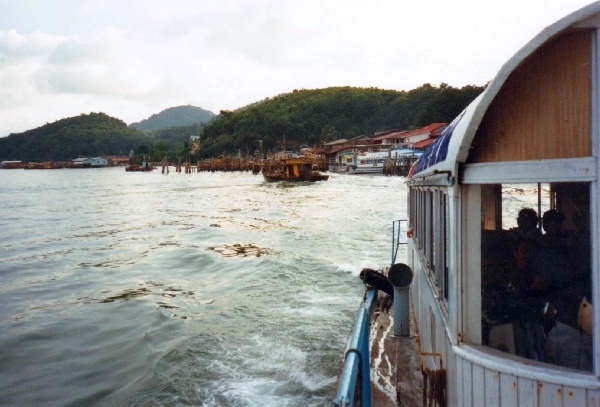 Farther down the western coast, I took a boat to the island of Pangkor. The beach was okay but its real attraction was its beautiful old-growth rainforest that was so dense that you almost needed a flashlight at mid-day to see. Even with a flash, it wasn’t really possible to capture the beauty on camera. I saw no rare animals but an abundance of colorful butterflies amidst the lush foliage. From what I have read, most of the eastern coast of the peninsula has been cultivated for rubber and palm oil plantations so this is a rare example of nature conservation for this part of Asia. 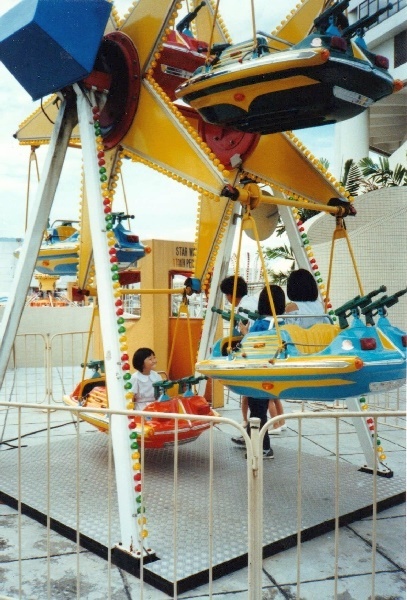 The photos show the boat ride over and arriving in the harbor. The independent city-state of Singapore at the southern tip of the Malaysian Peninsula was good for a couple of days but not much of its old architecture has survived. 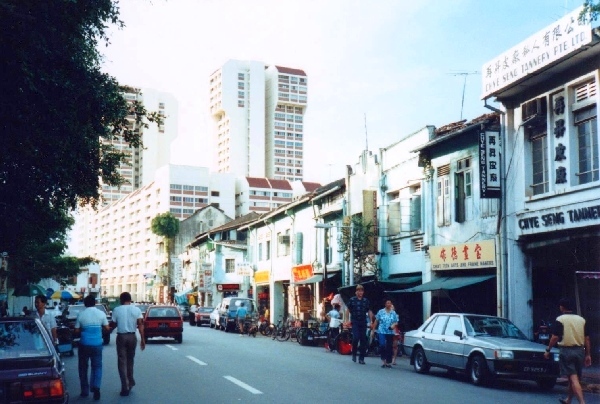 It’s mostly a modern, bustling city with an occasional old building or two amidst the high-rises. What is interesting is its mixture of people, cultures and religions. 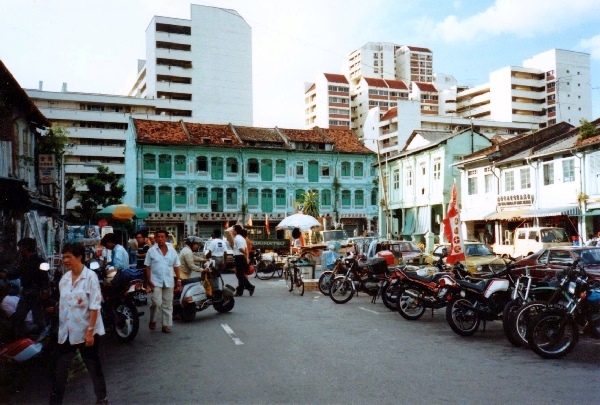 There are not just local Malaysians but also large populations of Chinese and Indian decent as well, living in relative harmony and prosperity. I can get by in a few European languages but find it kind of mind-blowing that many people there grow up learning 3 or even 4 such different languages as Chinese, Malay and English. But my honest appraisal is that it might be a very interesting place to live; it doesn’t really hold much interest for tourists like me. But then I would rather see an old castle or temple than a mega shopping mall. 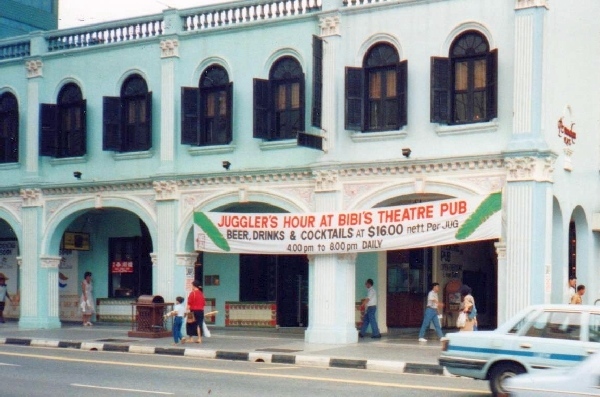 I considered going in to this place below right to see if I might get some free beer in exchange for a small juggling demonstration. They were obviously playing on the meaning of the word jug but I doubt they actually expected any jugglers to make an appearance! 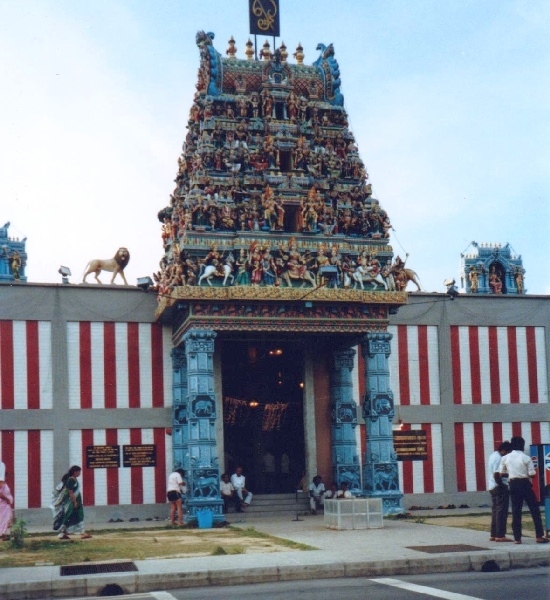 Singapore is well known for its strict rules concerning cleanliness. Well known are its high fines for having chewing gum. 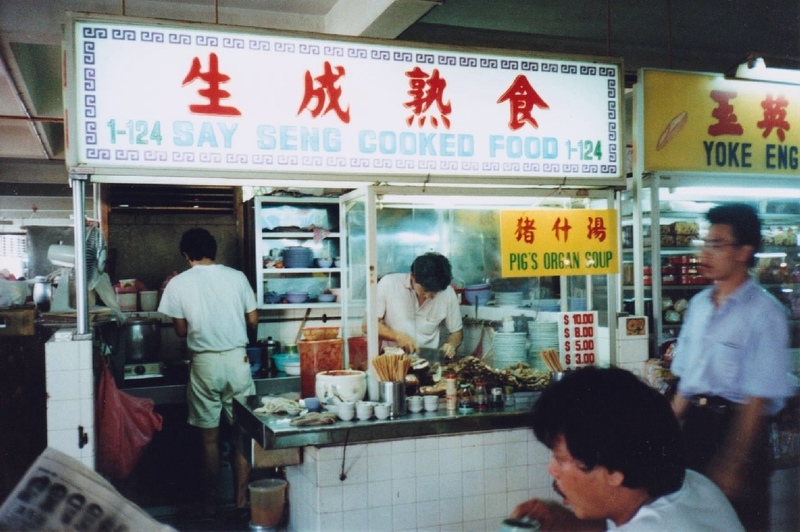 Much of the traditional food stalls had been moved from the streets to indoor food malls. I remember getting a meal, which they put into a Styrofoam container and then into a plastic bag. I found this an excessive creation of non-biodegradable garbage since I wanted to eat it right away – of course with the plastic silverware they had given me. I was told it was due to sanitary rules. Guess nobody was thinking about recycling or where all the plastic should be disposed of. Probably got bundled and shipped off to be dumped at sea – like who cares as long as it’s out of Singapore. This stall was offering pig organ soup – ha, ha need one comment about that. 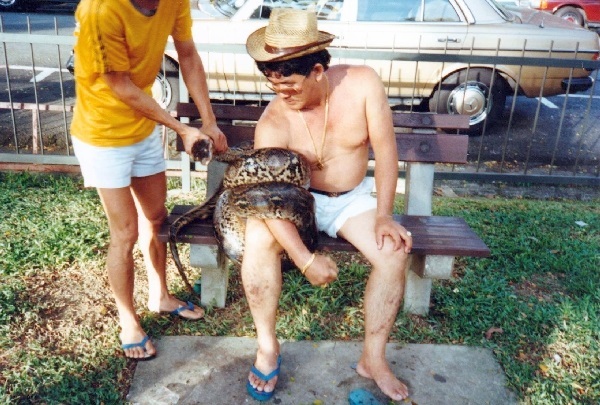 Don’t know what the city’s rule on snakes is but I saw this guy acting macho and fooling around with this big python in a park. Such reptiles used to be numerous on the Malaysian Peninsula but due to poaching and loss of habitat one wonders how long they will be around.